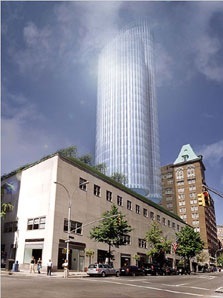 The Landmarks Preservation Commission voted against the proposed development of 980 Madison Avenue, featuring the glass towers atop a low existing structure. After all the fireworks we were hoping for something a little more conciliatory. Is the LPC getting gunshy? Did the project never have a chance in hell from the get-go? Will the developer continue at this location? Via Curbed, where they include entertaining quotes from the Commission.